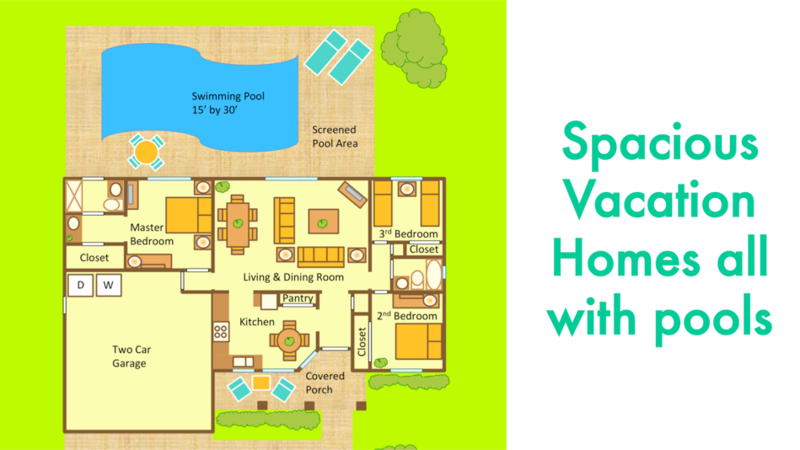 Looking for the perfect vacation rental home with pool in the Disney World area? You’ve found it! Welcome to InnHouse Vacation Rentals. What are you looking for in a vacation home in Orlando, Florida? If you think about spacious homes, light bright interiors, swimming pools, covered porches, large lots, big driveways, and palm trees in great locations then we have the perfect vacation home for you. Rates start at $100 per night + 13.5% taxes. At InnHouse we have a collection of vacation rental homes all with private swimming pools, full size kitchens, and all approximately 5 minutes drive from the Walt Disney World resort - including Magic Kingdom, Epcot, Disney’s Hollywood Studios, Disney’s Animal Kingdom, Disney Springs, Typhoon Lagoon, and Blizzard Beach - and an easy drive to SeaWorld, Discovery Cove, Aquatica, Universal Studios, Islands of Adventure, Volcano Bay, shopping, dining, golf courses, bike trails, movie theaters, Orange County Convention Center, and the areas’ other attractions. We keep making a reservation easy. We eliminate the wasted time and frustration of endlessly scrolling through pages trying to find a home and clicking and e-mailing to figure out what it is going to cost. Simply select your dates and the size home you need and we'll do the rest. When you book your vacation rental directly with InnHouse your vacation is not just simply an online transaction, we are here from Check-in to Check-out to make sure you have a great stay. Our website it is divided into four sections. “Vacation Homes” has information on our vacation homes and rates. “Reservations” outlines the reservations procedures and you can also make your reservations there or call us. “Locations” has information about the area and the proximity of the homes. Use “Connect” to contact us. - Enjoy!